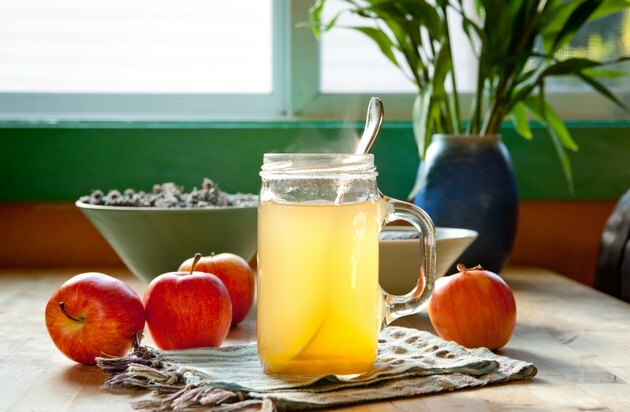 In the natural health world apple cider vinegar is considered a cure-all, with claims that it improves digestion, boosts immunity and promotes weight loss. 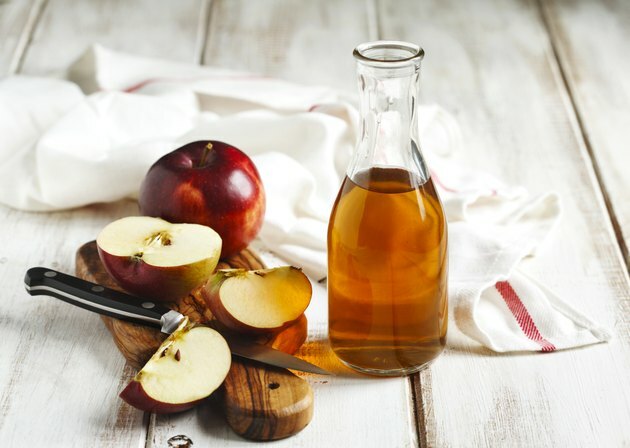 Made from fermenting sugar, apples and yeast, the amber-colored vinegar is rich in acetic acid, the compound to which its purported benefits are attributed. Although research results are mixed and limited, apple cider vinegar may contribute to weight loss through its effects on metabolism, appetite and blood sugar. However, the impact is small when compared to the effects of diet and exercise. It’s thought that acetic acid — the active ingredient in all vinegars — impacts the way the body metabolizes fat. Much of the research investigating this theory has been conducted with animals, so the effects on people are still uncertain. However, a few small studies involving humans point toward positive results. In a study published in 2014 in Bioscience, Biotechnology, and Biochemistry, 155 obese Japanese people consumed a daily beverage containing either 15 milliliters of vinegar, 30 milliliters of vinegar or no vinegar. Dietary intake and exercise levels were equal among the three groups. After 12 weeks both of the vinegar groups lost weight, with the high-dose group losing more than the low-dose group. However, in both groups the results were small — two to four pounds over three months. In another study published in the Journal of Chiropractic Medicine in 2013, a group of men and women drank a daily green drink containing apple cider vinegar, wheatgrass, alfalfa and fulvic acid. They were also given an oral supplement consisting of various herbs, such as cat’s claw and pau d’arco. In addition, the study participants followed a reduced-calorie diet that ranged from 1,200 to 1,800 calories daily. At the end of the 21-day study, the men and women had lost a little more than eight pounds. 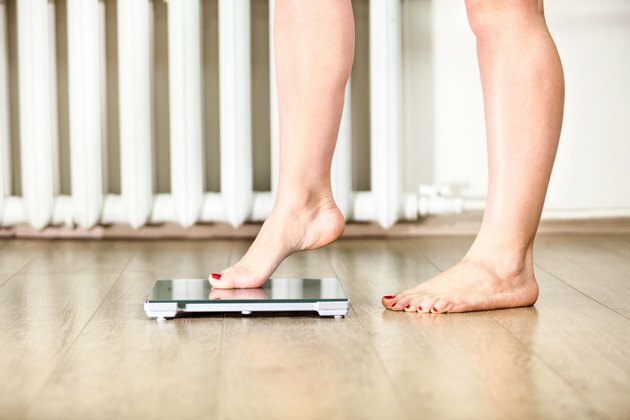 While the participants in the study lost a significant amount of weight in a short period of time, it’s difficult to determine if it was the apple cider vinegar, one of the other supplements or the low-calorie diet that helped with the weight loss. One way apple cider vinegar may aid weight loss is by increasing satiety and helping you eat less. Highly acidic vinegar taken with a bread meal helped participants feel full more quickly in a 2005 study published in the European Journal of Clinical Nutrition. Split into groups receiving vinegar of three different levels of acidity, participants in the highest-acidity group experienced the highest levels of satiety. That satiety also lasted the longest after the meal. Researchers suggest that the effects had to do with vinegar’s impact on post-meal blood sugar levels. Another study suggests a different, not-so-good reason vinegar reduces hunger: It can make people feel sick. In a 2014 study published in International Journal of Obesity, healthy, normal-weight subjects were given a vinegar or non-vinegar drink alongside a breakfast meal. The group receiving the vinegar drink became full more quickly, however, they also reported feelings of nausea. The hunger control in the 2005 European Journal of Clinical Nutrition study may have been partly related to vinegar’s impact on blood sugar. The researchers of this study found that the higher the acidity of the vinegar, the more it lowered blood sugar. Preventing spikes and drops in blood sugar after a meal can prolong satiety and prevent hunger soon after eating, which, of course, can help you lose weight. Another study published in 2005 in the Journal of the American Dietetic Association reported that vinegar improved post-meal blood sugar and also noted that the participants ate slightly fewer calories the rest of the day. A few animal studies have shown potential benefits of apple cider vinegar for heart health. In a 2008 study published in Pakistan Journal of Biological Sciences, normal and diabetic rats fed apple cider vinegar for four weeks had improved serum lipid profiles. Both groups had lowered low-density lipoprotein (the unhealthy cholesterol) and increased high-density lipoproteins (the good cholesterol). Reduced serum triglyceride levels were also lower in both the diabetic and non-diabetic rats. In another animal study, mice were fed a high-cholesterol diet as well as apple cider vinegar. Compared to the control group that did not receive vinegar, the vinegar-fed mice had lower serum lipid levels at the end of the 28-day treatment period. The results were published in The Journal of Membrane Biology in 2014. But to date there have been no human studies to corroborate these results. There’s some preliminary research suggesting the ability of apple cider vinegar to kill or slow the growth of cancer cells. In a 2014 study, the results of which were published in the Journal of Gastroenterology and Hepatology, acetic acid was added in varying concentrations to rat and human gastric cancer cell cultures. A 0.5 percent solution of acetic acid induced more than 80 percent cell death in one minute. After 10 minutes, nearly 100 percent of the cancerous cells had been killed. Researchers concluded that acetic acid is a powerful anticancer agent, the topical application of which could be a feasible treatment for gastric and other types of cancers. The most common way to drink apple cider vinegar is to dilute it in six to eight ounces of water. But some people like to take it in a shot, either on its own or combined with other ingredients like honey and turmeric. You can also add it to a smoothie with fruits and vegetables. Alternatively, a salad dressing made with apple cider vinegar, a small amount of olive oil, herbs, spices and other healthy ingredients is a flavorful, low-calorie way to get your daily dose. There isn’t a recommended dose of apple cider vinegar if you’re looking to lose weight, but one to two tablespoons is a common amount. You can take it all at once diluted in water or divide the doses. In the beginning it’s a good idea to start with a small dose, such as a teaspoon, to see how your body reacts to it. Assuming you have no uncomfortable results, you can gradually work your way up to a tablespoon or two. If your primary reason to consume apple cider vinegar is weight loss, you may have stumbled across the apple cider vinegar diet. Though there are slight variations of it all over the internet, it typically involves consuming one to two tablespoons of vinegar per day. The vinegar is usually added to a glass of water and consumed all at once or divided into doses taken before each meal. Taken in these doses and diluted with plenty of water, there is little risk of any serious side effects other than nausea and upset stomach. However, consuming more than this amount on a regular basis can have more serious consequences including tooth erosion and low potassium levels. And because of its effects on blood sugar, diabetics should be cautious about consuming high-vinegar diets. Additionally, it should be noted that apple cider vinegar isn’t a magic potion for weight loss. Though there are promising benefits when it comes to dropping pounds, you should still consume a healthy, balanced, reduced-calorie diet full of fresh fruits and vegetables, lean protein and whole-grain carbohydrates. Several supplement makers offer the apple cider vinegar in pill form for people who have a difficult time with the acidity and taste of the vinegar as a liquid. These pills contain a powdered apple cider vinegar, and the directions suggest one to three capsules or tablets taken one to three times a day. Apple cider vinegar in pill form may not contain what it says on the bottle, according to a 2005 report published in the Journal of the American Dietetic Association. Due to an adverse event caused by an apple cider vinegar capsule that led to an esophageal injury, tests were conducted to assess acidity, microbial content and pH of a number of different brands of apple cider vinegar in pill form. The tests showed wide variability in all three categories, leading to questions about whether some of the supplements even contained apple cider vinegar and challenging both the quality and claims of apple cider vinegar supplements. So before adding apple cider vinegar pills to your daily regimen, be sure to first consult your doctor for advice. If you do get the OK, make sure that you look for a high-quality supplement through a local health store. Have you ever tried apple cider vinegar? What did you think? Were you trying to lose weight? Do you think it helped? How did you consume it, as a tonic or a shot? Did you know about all the other benefits of apple cider vinegar? Share your thoughts, suggestions and questions in the comments below! Pakistan Journal of Biological Sciences: Apple cider vinegar attenuates lipid profile in normal and diabetic rats. The Journal of Membrane Biology: Apple cider vinegar modulates serum lipid profile, erythrocyte, kidney, and liver membrane oxidative stress in ovariectomized mice fed high cholesterol. Ned Tijdschr Tandheelkd: [Unhealthy weight loss. Erosion by apple cider vinegar]. Harvard Health Publications: Apple cider vinegar diet: Does it really work?